Coverage: Live commentary on Radio 5 live sports extra plus live text on Murray v Nishikori on the BBC Sport website and app. 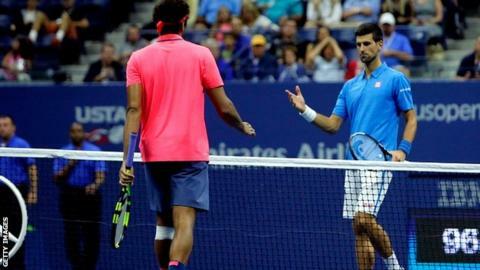 Defending champion Novak Djokovic is through to the US Open semi-finals after a knee injury forced Jo-Wilfried Tsonga to quit when trailing 6-3 6-2. Djokovic, 29, has completed just two of five matches in New York, benefiting from a walkover and two retirements. He will face another Frenchman in the last four after Gael Monfils beat compatriot Lucas Pouille 6-4 6-3 6-3. "This was the scenario that I needed and I wished for," said Djokovic, who has faced his own health issues. The Serbian world number one arrived at Flushing Meadows nursing injuries to both his left wrist and right elbow. "I got a lot of days off and recovered my body," he said. "Right now I'm feeling very close to the peak. That's the position where I want to be." Second seed Andy Murray takes on Kei Nishikori on Wednesday, before Juan Martin del Potro and Stan Wawrinka play the last of the quarter-finals. In the women's draw on Tuesday, Denmark's Caroline Wozniacki beat Anastasija Sevastova 6-0 6-2 in another match marred by injury, with the Latvian severely hampered by a twisted ankle. Wozniacki won easily to set up a semi-final against German second seed Angelique Kerber, who beat Italy's Roberta Vinci 7-5 6-0. Djokovic had won 13 of his last 14 matches against Tsonga, who hit 19 unforced errors and failed to win a point on his second serve in the opening set. The Frenchman's predicament worsened when he required a medical timeout for attention to his left knee after falling a double break down in the second set. After watching Djokovic seal the set with an ace, he then approached the net and held out his hand to bring an end to the action after 81 minutes. "I know Jo well, he's a fighter and this is something I'm sure he didn't wish for," said Djokovic, who is through to his 10th consecutive semi-final in New York. Pouille made 44 unforced errors as the five-set win over Rafael Nadal appeared to take its toll on the 22-year-old. Monfils maintained his momentum either side of a 15-minute rain delay to seal his first Grand Slam semi-final appearance since the 2008 French Open. "It's a court I love," he told the New York crowd. "I always say that the French is my home, but this one is my second." Monfils, 30, has yet to drop a set in five matches at Flushing Meadows.